When I was in my teens, a baking oven made its presence in our house for the first time. It was from delhi, on demand by mom. Mothers get light-headed on finding a new recipe or a new utensil. You would be forced to eat rice sevai, after lot of huffing and puffing ( the real deal) and pressing the sevai maker or you would be eating home made ice cream every week ( the new refrigerator , u see), not to mention the ice cream would be more like a sorbet with all the power outages..LOL. Our craze for butter biscuits started with the entrance of the oven. Mouth watering, melting butter biscuits. The ones you would see in all Pottikadais( kiosks) all over India. Those in dirty old bottles , showcased right in front of the shop.Well, you get them in bakeries too. Also called Nankhatai. 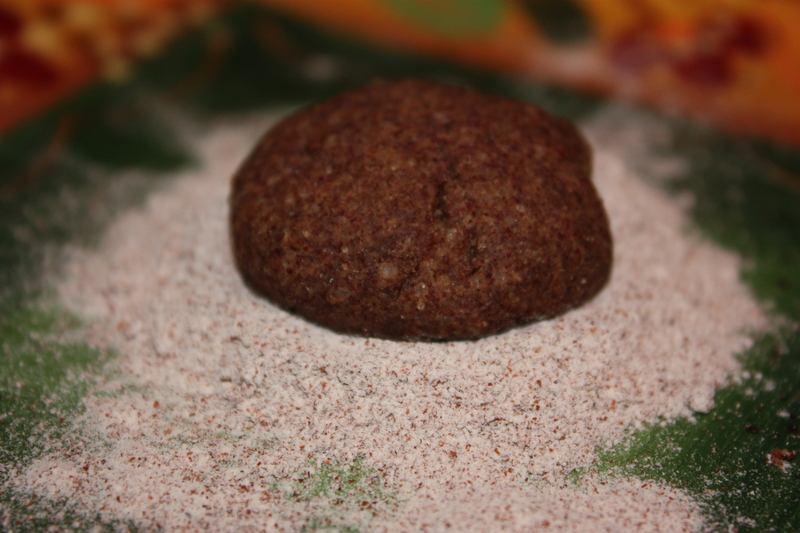 When I visited home last summer, I chanced upon some yummy Ragi( Finger Millet) biscuits in a bakery.Seeing the JFI:Raagi at Eggless cooking triggered that memory and I decided to try it out at home. Mom makes raagi dosa, raagi rotti, raagi kanji, raagi mudhe , raagi adai and I have eaten Ragi Puttu as well. A versatile grain and one that should be a must in every household. Today millet ranks as the sixth most important grain in the world.Millet was introduced to the U.S. in 1875, was grown and consumed by the early colonists like corn, then fell into obscurity. At the present time the grain is widely known in the U.S. and other Western countries mainly as bird and cattle feed. 1. Mix the butter and sugar , to a creamy consistency. Make sure the butter is at room temp. If you are in a hurry, take a stick from the fridge and melt it slightly in the microwave. 2. Mix the ragi flour, wheat flour,cocoa powder and cardamom with the creamy butter& sugar. 3. Make round balls of the mixtureand bake it. 1. You can increase the cocoa and reduce the ragi slightly to get a more chocolaty flavour. 2. If you reduce the flour, you will get airy butter biscuits. 3. Feel free to substitute whole wheat pastry with all purpose( maida) flour. 4.You can add 1tsp vanilla extract to enhance the flavour. 5. My sugar crystals are pretty huge.I should have ideally powdered it before stirring in with the butter. If you look at the picture closely, you will see the sugar grains. The taste is still the same though. I have never tasted ragi biscuits before. Great recipe Shoba. Thanks for sending it to the event. Thanks for the global statistics and the history of this humble grain! Recipe sounds healthy and great. Happy smacking! Sounds lovely. I will try this very soon at home. The high fiber content will surely aid Keena, and this is a tasty way to get it in. 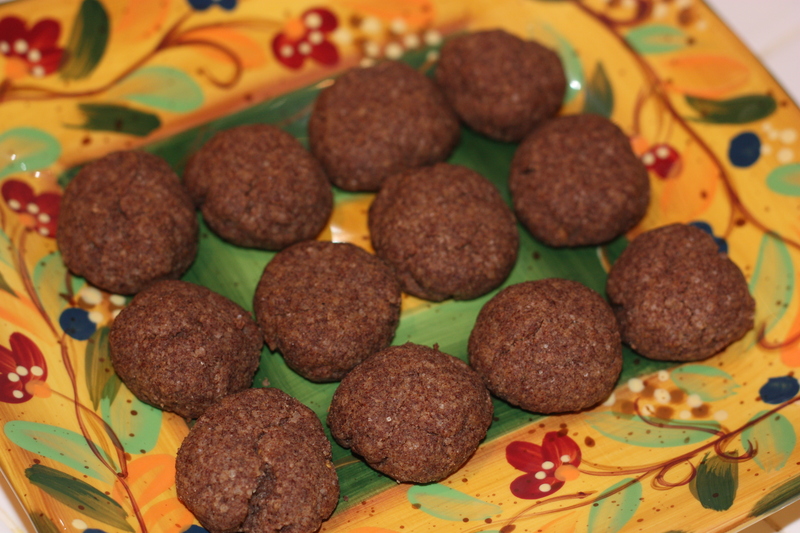 Ragi butter biscuits – here I come! Thanks for recipe Shoba. Neyi…Sakkarai…. I am sure Keena will like it. Nice recipe, but could you please explain the temperature and time for baking?